Because you might need to keep information on a Web page, you can save the page. Saving a Web site page allows you to view it offline, work with its information, and print it, for example. When you save a Web page, you’re saving the page as it currently exists on your screen. To see any subsequent changes, you must revisit the actual site. 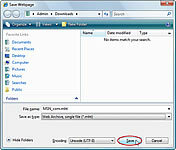 1Choose Save As from Internet Explorer’s Page menu. 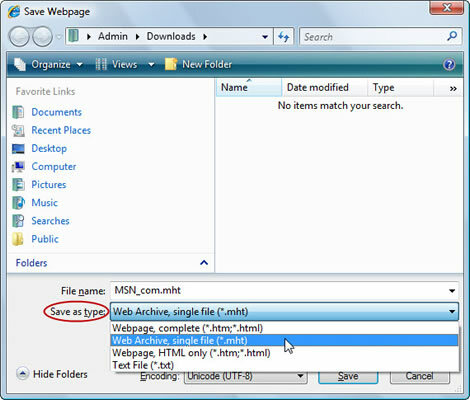 When the Save Webpage box appears, Internet Explorer enters the Web page’s name in the File Name box and fills out the Encoding box automatically. 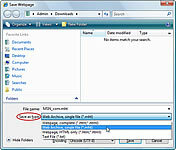 2Use the Browse Folders drop-down list to choose where you want to save the file. Internet Explorer normally saves the Web page in your Downloads folder, accessible with a click on your username that sits atop the Start menu’s right corner. 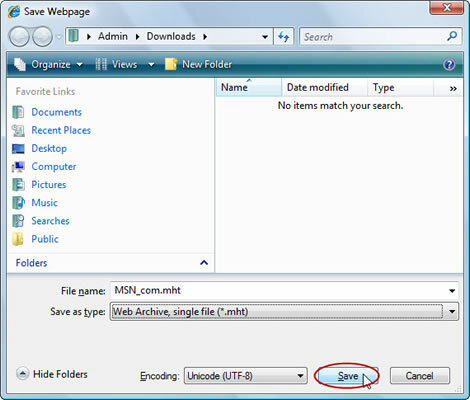 To save the Web page in a different folder, perhaps Documents, click the Browse Folders drop-down list. 3Choose how you want to save the page in the Save as Type box. Internet Explorer offers the following four different ways to save the Web page: Webpage, Complete (*.htm;*.html); Web Archive, Single File (*.mht); Web Page, HTML Only (*.htm;*.html); and Text File (*.txt). 4Click the Save button when you’re done. The Web page is safely stored on your computer so you can view it when you’re not online. Note that when accessing a Web site that you’ve saved on your computer, you can only review the site’s content. The Web site’s hyperlinks and other interactive features won’t work unless you get online.